In the year 2011, SBRM was certified as an ISO 9001 and an ISO 14001 organization. ISO 9001 implies that we maintain high standards when it comes to the quality of the product or managing the various activities of the organization. ISO 14001 certification signifies the importance we give to protecting the environment, employees and workers health, and their working conditions, etc in all processes undertaken in the organization. 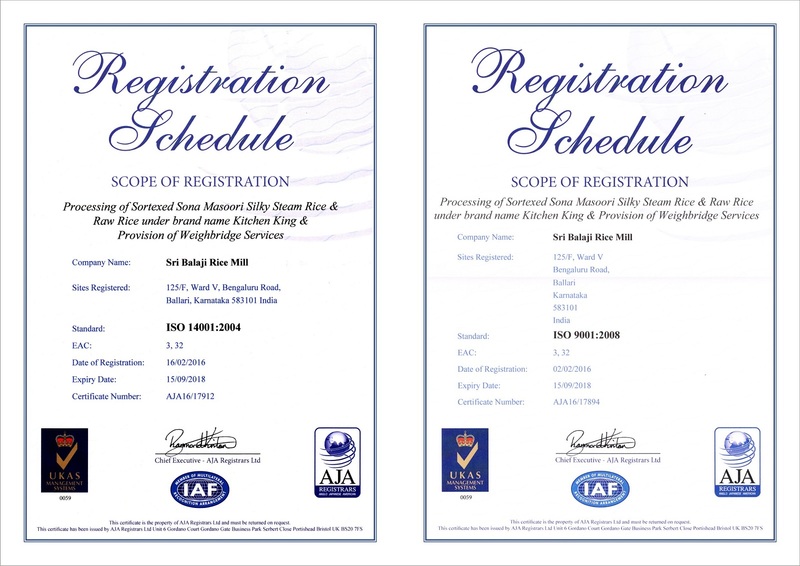 Infact, SBRM is the first Rice Mill in Karnataka to be certified with both these certifications. Quality Purchases: We purchase only best quality paddy from farmers directly from their paddy fields (from the surrounding areas of Ballari). Every bag of Paddy is sampled at the time of loading and any defective quality is rejected at the site itself. The average moisture of paddy is checked at the time of loading and unloading. At the time of unloading, if the paddy quality is not good, the entire lot is rejected. Even if the seller quotes lower price for his low-quality paddy, it will be rejected outright. Process / Quality : Paddy is fed in such a way that moisture of that batch is maintained uniformly. Before actual processing, paddy is made to pass through several tests to ensure that uniform quality is maintained in further processes. Storage: Our Paddy is primarily stored in Silos, which are scientifically designed structures to provide optimum storage conditions for paddy, along with proper ventilation and protection from climatic conditions, thus increasing the longevity of the product and maintaining its quality in the process. Technology : The entire plant runs on Buhler technology, the pioneers in the field of Rice processing. Internationally reputed 'Cimbria Rice Grader' is installed to ensure proper sorting of Rice and Broken Rice. To maintain uniformity of the grain size, thick and thin graders are also installed. To ensure stone free rice, we have installed Paddy de-stoner as well as a separate Rice de-stoner too. Cooking : All the batches of rice are cooked regularly & its results are analysed periodically to ensure its quality. Hygenie : Hygiene is of utmost importance to us. All the bins are coated with Food Graded paints to ensure healthy consumable grain. The entire machinery section is virtually dust free to ensure health of the workers and also maintain the quality of the grain. We have even incorporated automatic packing to ensure that the grains remain untouched by human hands even when they are packed. Trust : Our esteemed customers are spread all over India in general and South India in particular. We have maintained their trust and goodwill since 1980. They trust in our quality and believe our words. Care for Environment and Safety of Employees: As much importance as SBRM gives towards maintaining the quality of its products, it also ensures that the same does not cause any surrounding environmental damage or affect the health of its employees. In its efforts to improve the environment, many trees have been grown all over the factory premises. Also adequate measures have been taken to ensure safety of employees and their working environment.